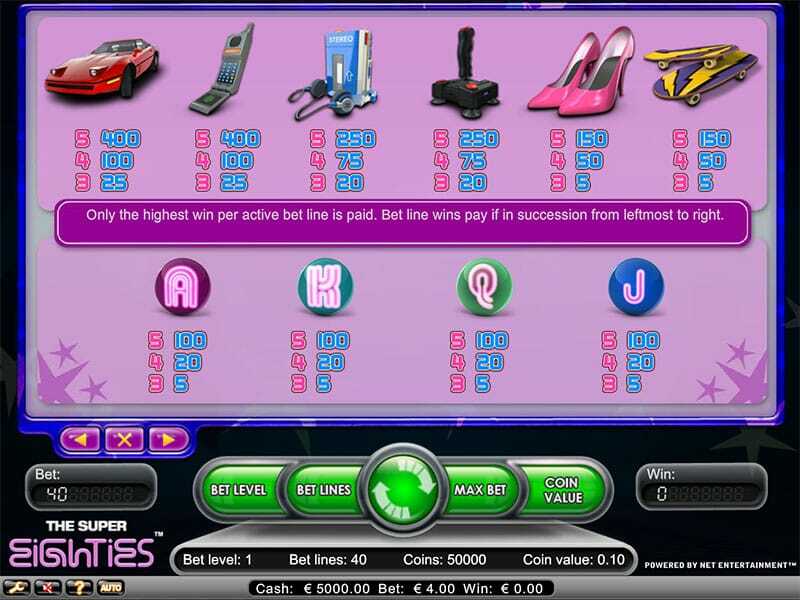 Here's one of the superb Slots online game from NetEnt. 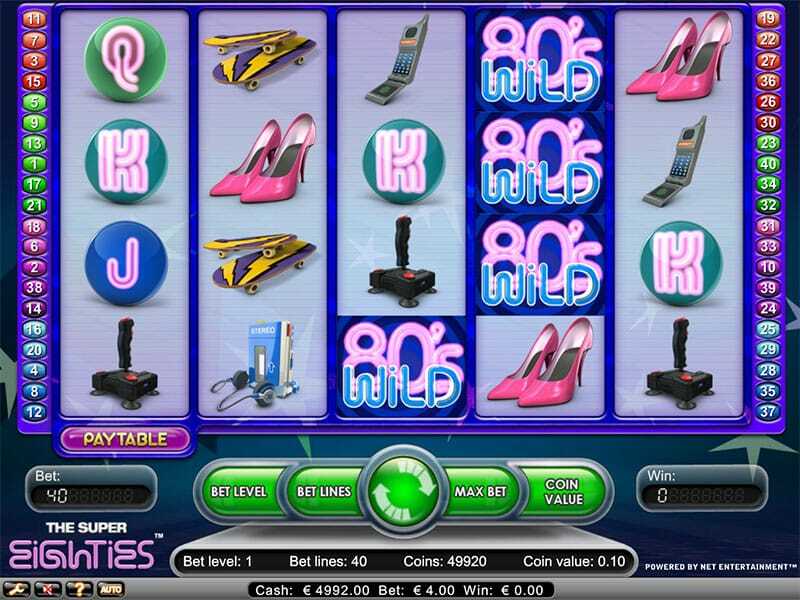 An online slot game completely dedicated to the memory of the 1980s! This online casino game pays homage to all things 80s including: the outrageous fashion of the era, the distinctive style of music and even the emergence of skateboard culture! So keep groovin' while winning in this throwback slots games! This game has a couple of very interesting features to keep you engaged. The first of these features is the auto play option. This allows you to take up to 1000 spins at once without any interruptions. You can also handily customise how auto play is used in your personal preferences. The other interesting feature in this game is the skill stop option. When using this option, you can stop the reels mid-spin to try and land on what you think will lead to a winning combination. This will also save you some time in your gaming session and allows you to have a bit of control over what is largely a game based on chance. Super Eighties comes with a wide range of bonus symbols. These include stacked Wilds, animated Scatter and 2x multiplier Free Spins. The Wild symbol has the power to replace any other basic symbol on the reels in order to help you land one of the winning combinations. The only exception to this rule are the Scatter symbols. If you can collect three Scatter symbols then your wins will be doubled and you’ll also be rewarded with five free spins. While in Free Spin mode, you can also continue to double your wins and collect even more Free Spins and Scatters. Since being founded in 1996 and launching their first online casino in 2002, NetEnt have become of the most established developers in the online slots industry. Three-time award winners at the 2015 ERG B2B awards (Slot Provider of the Year, Mobile Supplier of the Year and the award for Innovation in Mobile), NetEnt are highly respected for their work within the field on online casino games. Supplying games to over 170 online casino operators, they’ve developed over 200 titles including Dracula, The Invisible Man, Gonzo’s Quest and Starburst. If you love promo's, get the best slots offers. Even if you weren’t around in the 80s or you don’t remember much of it, this is an incredibly fun online slot game to play with. The ‘80s themed symbols available as part of the game add to the fun as does the retro pop style soundtrack in the background. The bonus features and options such as auto spin and the Free Spin mode make the game even more enjoyable and will keep you coming back for more! If you enjoyed Retro Super 80s then you might also like Sweetie Land.